Rohan whacked his arrow with the heel of one hand. - And here we see that Rohan is indeed descended from Tenzin and related to Sokka. Kai su, teknon? - Greek: "And you, my child?" Reputed by some ancient sources to have been Julius Caesar's last words (Shakespeare's "Et tu, Brute?" is a Latin variation on the same theme), though other authorities of the time claim he didn't say anything. Here meant in the sense of, "You're one to talk," with the added sarcastic touch that, by using teknon, Corwin is addressing her as his offspring. There's a slight meta dimension to this, because if the timing had worked out differently and I had been the one to design Korra's importation into the UF universe, she would probably have been one of those characters - like Rei Ayanami - who end up fairly far from home, setting-wise. Given her skin tone (a bit lighter than Anthy's), her eye color (very like Corwin's), and her general demeanor, she might very well have been Corwin's daughter. Phil got there first with his design for Diqiu and all that it implied, though, and well, fair's fair. pinepear pie - Hey, the Avatar setting is rife with chimerical animals. Why not chimerical fruits as well? "Magic Carpet Ride" - Yes, of course it's really a song about tripping balls on acid. Corwin's playing it as a joke anyway. Shiro Shinobi Arena - In The Legend of Korra, this facility does not appear to have a name beyond "the pro bending arena", which is a bit like a Major League Baseball stadium being called "the ballfield". Here it's named after the late, great Shiro Shinobi, for many years (including all of Korra's professional career) the acknowledged Voice of Pro Bending on Republic City Radio (and probably early television later on). This is largely owing to Korra's refusal (as part of a lifelong campaign of refusal) to let the owners name it after her. "Shiro Shinobi was the voice of the sport for 40 years, people. If I wasn't the Avatar, I would've gone down in pro bending history as that one pretty good waterbender who got a yellow fan on her first ever play. Do the math." dangerball - This sport was an attempt to create an offshoot of pro bending that non-benders could also compete in (as a converse to parallel efforts to introduce foreign sports, like baseball, in which bending simply doesn't enter into the gameplay and it therefore doesn't matter much if the players were benders or not). Dangerball teams consist of six players - one of each type of common bender and three non-benders who, by the nature of the sport, tend to be elite martial artists (though chi blocking is not allowed). The gameplay itself is kind of a cross between box lacrosse and mixed-martial-arts cage fighting. (Usually the earthbender is the goalkeeper, but sometimes teams like to mix it up a little to see what happens.) It's exciting stuff, but too violent for some tastes. It can't be shown on TV before the watershed, for example. One of my favorite little images in this piece. If Mogi's "dialogue" were subtitled, the subtitle here would probably say something along the lines of, "'Sup." very smart business attire - Professor Asami Sato, Ph.D., president and CEO of Future Industries, founder of Sato Computing Machines, Flight Operations Director of Project Phoenix Flight. Easily as towering a historical figure in 3rd-century Diqiu as any Avatar, and unlike her father, an inspirational figure to non-benders and benders alike. A case could be made for her as the Jacqueline Cochran of Diqiu's Aviation Age, the Sergei Korolev of its Space Age, and the Alan Turing of its Computer Age, all of which got underway during her very eventful lifetime. hair styled to frame her face - A hairstyle popular in the Fire Nation since the second century ASC, but nowadays rarely seen except on female firebenders of a particular school. Considered either classic or dated, depending on the observer's attitude toward such things. Compare to a present-day young woman wearing her hair like Marlene Dietrich in Shanghai Express. Although, if a person were to wear her hair like Marlene Dietrich in Diqiu, people would probably assume she was taking her style cue from the late Lin Beifong. inking pad - In Diqiu, as in real-life East Asia, there's a long-standing tradition of using stamped impressions (seals or "chops") to establish one's identity on documents, rather than writing one's name by hand. The technique is in the process of falling out of fashion in 25th-century Diqiu, but enough people still do it that places like the Phoenix House provide the facilities with which to do so if patrons wish (though even they use modern ink nowadays). Utena R. Tenjou - The "R" stands for "Ravenhair", of course; her concession to the fact that it would be silly of her to take his very descriptive surname, even if such a thing were her style, which it isn't. She's signed a few other things that way before this point, but they were all Space Force documents (such as her Operation TRIDENT preliminary report) and Corwin hasn't seen them. a keen student of other cultures - There are a number of Einherjar from the Fire Nation. Let's just leave it at that. South Pole settlement of Senna - Korra inherited her parents' house in the South Pole after they died, and kept it as her official personal residence - largely to keep well-meaning-but-not-clueful people from enshrining it as "Avatar Korra's Birthplace". She was not expecting them to rename the village after her mother, but she decided to let that one stand, as that was a more fitting tribute. cactus juice - Utena thinks this is just the name of a cocktail, in much the same way that a screwdriver is not actually an implement for driving threaded fasteners. It... isn't. Though, the Phoenix House does water down the cactus juice it serves. Having their guests wriggle their way across the hotel lobby like inchworms would send the wrong message about the hotel. Badgermole cards - Zambo the Badgermole is the well-loved mascot of the Republic City Subway, and regularly shows up at grade schools to talk about train safety. He carries on the honored tradition of the Earth Kingdom's own transportation systems of Omashu and Ba Sing Se, the latter of which also has the Subterranean transport network (Corwin wants one of their signs for a wall in his apartment, but hasn't gotten his hands on one yet). Korra was really motoring now - It is unclear whether she actually employed the Avatar State to counter a pie ambush. Probably not. Master Tenzin would certainly not have approved. Well, by this point, she's practiced and skilled enough she doesn't normally need the Avatar State for a power boost for most casual things. white goatee instead of a grey mustache - Meelo inherited his father's beard, while Rohan got Tenzin's moustache, if you need help visualizing them. call this round a draw - The pie war has been raging since Meelo was five. I don't think they even remember where the score stands by this point. My Little Destroid - They're watching Friendship Is Tactical, of course, not the soppy original cartoon. That's not even airing on Saturday mornings any more. Tongyu - The local name for the language most commonly spoken in Diqiu (and an old name for a precursor of Mandarin Chinese in the real world). Literally means "common language". Speakers of Mandarin can generally understand it, although some of Diqiu's peoples (the Water Tribes, for instance) would have really wacky-sounding accents to them. 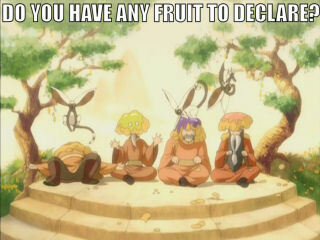 some sort of peach - Moon Peaches were a frequent harvest crop at the Southern Air Temple, and Avatar Aang transplanted several of them to Air Temple Island when he moved to Republic City full time. airbending master ... avoiding the gates - After all, Master Meelo is an expert at "Being the Leaf". lemur - This is an original winged lemur, like Momo in Avatar: The Last Airbender, not one of those scruffy ring-tailed ones. I make no apology for this. Nyima - A character, like Rina Dragonaar, who was supposed to just direct someone else to a meeting, and who instead arrived with a complete description and fast-developing backstory. Her name is the Sherpa word for "Sunday" and presumably denotes the day of the week on which she was born. Lhakpa - Similarly, "Lhakpa" is the Sherpa word for "Wednesday". There's usually less complexity for those who make travel reservations to Diqiu over the web. People not in the know have no idea what that weirdass captcha at the bottom of the reservation page is for. pleased to receive your RSVP - "What is your ultimate destination once you reach Diqiu?" all the way to the coast - "Republic City." Uehara and Saikyo Central Railroad - Of the two Zipangi cities involved in the name of this railroad, the former is named (outside the story, anyway) after Boston Red Sox relief pitcher Koji Uehara, while the latter - Zipang's capital - bears a name briefly used for feudal Japan's imperial capital, Kyoto (Saikyo being Japanese for "Western Capital", as opposed to Tokyo, the Eastern Capital). As the name suggests, the U&SC is the result of a merger between two railroads, the Uehara and the Saikyo Central. next major Zipangi city heading west from Uehara - This would involve circumnavigating the planet at that latitude to return to Saikyo, which is rather longer than most people would be willing to wait for a train. semiformal open-air marketplace - Central City Station was one of the nerve centers of Republic City life in its early days, until the rise of automotive and airborne traffic cut into the railways' business. However, it was still a popular hangout for Republic City's youth, and there were still regular trains, so the confluence of both led to temporary stalls and kiosks being set up at regular times of the year for people shopping for deals (since they wouldn't be blocking the heavier rail passenger traffic anymore). This practice got a serious shot in the arm when contact was made with Zipang and regular travel was established between the two worlds, since this meant that the marketplace would now be the first stop for travelers arriving from Zipang to experience the cultures of Diqiu. They don't look exactly like this, but it gives you a flavor. dubbed "the Korramobile" - Yes, this is indeed the same sort of car Asami Sato drove in Legend of Korra, in case you're curious. rooftop space of the firebending academy - Most firebending academies of the "old school", both in the Fire Nation and the Colonies, had large outdoor courtyards adjacent to the school for vigorous outdoor practice, testing new techniques, and the occasional Agni Kai (in the days when they weren't to the death). Much less chance of setting the whole building ablaze if you do those things outdoors. Since there's a lack of regular open fireproof space in the big city, rooftop plazas are used instead for the same function. a couple hundred of them - Assuming that there have been four to six generations since Korra's realization as Avatar, and assuming that each of Tenzin's kids had three children themselves, and this carried down to their descendants, it is theoretically possible that there could have been from 108 up to 972 potential airbenders born in that time period, without interbreeding. This does not take into account deaths (natural or not), having fewer than three children, children born as non-benders, or as benders of a different element (e.g. after the spouse of the parent), so the actual numbers are likely not nearly as high as the theoretical maximum. Either way, airbending's no longer at risk of dying out. The Air Nomads are still hoping that new airbenders will start spontaneously being born to the particularly committed Air Acolytes as well, diversifying the population further, but so far this hasn't happened. Ice Wraiths - Rarely for the name of a Major League Bending team, not a chimerical animal. Not an animal at all, technically - ice wraiths are spirit entities that roam the frozen wastes of the North and South Poles. They're a natural function of the arctic regions of certain dense-magisphere worlds, and can also be found (among other places) in Cephiro and on the icepack of northern Tamriel, on Nirn. The Cephirean ones are normally not aggressive. The same cannot safely be said of their counterparts in Diqiu and Skyrim. small outbuilding in the courtyard - Naga, Korra's original polar bear dog, slept at Korra's bedside when she came to Air Temple Island. While she continued to do this throughout her life, eventually the hut was built to store her saddle and supplies, and to provide a ready den when she eventually became pregnant after a trip to the South Pole. Subsequent generations of Korra's polar bear dogs also sleep inside at night, but use the "doghouse" as a convenient place to get some shade and have a nap while outdoors. those weird masks - Fire Days Festival masks, traditionally worn for the eponymous celebration, which originated in the Fire Nation. Zatara the Magnificent - Stage name of three generations of sorcerers who have performed as stage magicians. Corwin's thought specifically refers the now-retired middle one, Giovanni Zatara the Younger, whose act he saw several times as a boy. Giovanni the Younger's father, the late Giovanni Zatara the Elder, was active in the 2300s and taught Laura Kinney the stage magic and escapology she employed first as his lovely assistant Laura Arcane, and later in her own career as Fang the Unconquerable. a sort of Lauren Bacall look - Specifically, Bacall as she appeared in her roles opposite Bogart in the mid-1940s (The Big Sleep, Dark Passage, and Key Largo). Rolleiflex - The German-made Rolleiflex twin-lens reflex camera is a distinctive piece of photography equipment dating to the 1930s. They were once popular press cameras, though more often seen in Europe than in the States (American press photographers preferred the Speed Graphic, made by Graflex of Rochester, New York), and are still made today for the art photography market. shy about the portion size - According to the Legend of Korra: Book 1 artbook, Kwong's Family Cuisine was a more stereotypical tiny-portions fine dining experience in the Avatar's early days in Republic City. Fortunately, they've moved on a bit by this time. In fact, it's an option on the reservations menu - small, moderate, or large portions. As is the option to have your guests dressed by the restaurant to meet the dress code if they're unable to provide their own outfits, though they are nowhere near as good as Ming's, and the reservation holder has to soak the cost of the clothing. the bouncer - If it helps, the bouncer looks strikingly like the Doorman from "The Revelation", just dressed better; he may even be a descendant. Either that, or there's a plant stamping them out of a mold somewhere. If Future Industries did make Terminators - and I'm not claiming they do, but if they did - they would look like that guy. Minox A3S - The Minox line of microcameras often turn up in spy films, being used to surreptitiously photograph documents and/or persons of interest: those little flat cameras that are operated by pushing a slidey part of the outer casing together and pulling it apart again. twenty-three skidoo, my good hotman - If the bouncer wanted to get into an obsolete-slang fight, Corwin's his man. Heck, he's even using "twenty-three skidoo" correctly. It means, roughly, "back on out of this before you get in over your head." tinheads - Long-outdated slang for the metalbenders who used to constitute virtually the entire uniformed division of the Republic City Police Department. Derisive, as you might expect. For some time after the Equalist uprising, the police metalbenders (who were, in that incident, about as much help as an anvil to a scuba diver) were not held in high regard by, well, anybody, really. "Tinhead" was even used by non-metalbender RCPD officers to describe their colleagues; compare the old custom of London police detectives calling uniformed officers "woodentops". don't take any wooden nickels - The motto of the Deedlit Satori Mandeville Memorial Institute. Emily presumably has no idea what she's talking about. morning edition of the Republic City Tribune - With the opening of travel to Zipang, and trade between the worlds, Standard editions of many periodicals came into existence, including the major newspapers of the time. Korra reads from either of them, whichever one is more convenient at the moment. Air Temple Island receives copies of both to help new Acolytes and their children in learning the language. the Tsunami Blue thing - Refers to a case Korra worked on with the RCPD a few years before this story, which took a turn toward mayhem in part because one of her IPO contacts was involved. Tsunami Blue was one of Republic City's organized-crime Triads. Emphasis on "was". Also, Tsunami Blue would be a good name for a Jaeger. gearPhone - While Cabbage Corporation brought computing to the masses with its line of Cabbage Computers and later laptops, it was Sato Computing Machines that came up with computers in the first place, from the "Big Iron" room-sized machines used for ballistics calculations during the beginning of Diqiu's Space Age to the more versatile embedded workstation models of its Information Age. They remain one of the leaders in desktop computers and communications technology, and popularized the use of mobile phones and a unified computer/phone network. everything but steam baozi - Like "what do you put in the noodles" last time, this is a common figure of speech involving food, "everything but bake lasagna", re-regionalized for Korra's culinary norms. a Neo-Russian motorcycle manufacturer - NOVIZHMASH, the New Izhevsk Machinebuilding Works, makers of the galactically renowned NovIZh Type 2593 "Molniya" ("Lightning") racing bike. like Yamazaki City on New Japan - Or, for that matter, like Toyota City in real-life Japan. ZTT - Zipang Telegraph and Telephone, the national telecom company of Zipang. 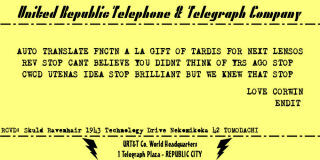 A LA GIFT OF TARDIS - The "gift of the TARDIS" to which Corwin refers is the automatic, telepathic translation function that Time Lord ships perform for their crews, seamlessly rendering almost everything they hear spoken or see written into a language they can easily understand. It's a bit fancier trick than annotated reality, which is more what Utena had in mind. CWCD - "Credit where credit's due"
 Chin - The United Republic of Nations and its capital city are blessed(?) with incredibly elaborate and for the most part efficient bureaucracies, courtesy of their roots in the Earth Kingdom, and have a vast and influential caste of civil servants running it all. Chief Civil Servant Chin is the latest in a long dynasty of prominent Republic City civil servants, dating all the way back to the city's founding. One of his ancestors can be seen delivering Councilman Tarrlok's various preposterous gifts to Korra in the early part of Book 1 of The Legend of Korra. Not to be confused with the infamous warlord Chin the Conqueror, though their forebears may hail from the same Earth Kingdom village. Councilwoman Okamoto - The council to which Korra refers here is not the old United Republic Council, long since disbanded, but the Republic City City Council, a charmingly-redundantly-named body which serves as the legislative branch of the city's municipal government. Councilwoman Okamoto is in the habit of importuning the Avatar for her help or her imprimatur on various civic projects, regardless of whether Korra is interested in them. Whenever any extravagant proclamation or random Gift from a Grateful City arrives on Air Temple Island of late, Korra assumes that it's Okamoto trying to get her to join the Select Subcommittee on These Kids Today with Their Clothes and Their Hair and That Noise They Think Is Music or some such nonsense. an elaborate fountain pen - Chin is also carrying a stamp pad in one of his sleeves of holding, but he correctly deduced that a person like Kate wouldn't want it and so didn't break it out. Niri - The latest in a long line of polar bear dogs who have served as friend, companion, mount, and guide to Avatar Korra, Niri can trace her maternal line all the way back to Korra's original animal companion, Naga (2278-2316). Her name is the Inuktitut root for "eat", which is what she does best (or at least with the greatest gusto). a hooded coat and a freaky mask - While the coat and uniform are a backup set salvaged from an Equalist safe-house during the recovery period after the Battle of Republic City (when the United Republic Forces worked to investigate and repair the damage from the fighting), the mask is in fact the very same one that Amon wore, recovered from Yue Bay after his outing as a waterbender. It was held as police evidence until the museum convinced them to release it to them for its historical importance. the University of Tothis - It may not surprise you to learn that the planet Tothis is in the Corporate Sector. Similarly, she had no interest in the one that would have said ON THIS SPOT IN 170 ASC, AVATAR KORRA AND SOME FIREBENDER GUY GOT WORKED LIKE A PAIR OF CHUMPS BY A COUPLE OF CLOWNS IN GIMP MASKS. a toy boomerang - The noble skill of boomerang making is one that has been passed down among the families of the Southern Water Tribe for generations! This particular one is the very popular Mr. Boomerang model (motto: "Mr. Boomerang always comes back!"). more than my poor parents could keep up with - Well, given the structural damage their house was experiencing from having a rambunctious four-year-old Avatar living there, you can't really be that surprised. a concert shell - It didn't come up in the story, but this is the Councilman Sokka Memorial Amphitheatre. The late councilman was well-known as a lover of the performing arts, if not always a discerning one. erhu - Speaking of which, Baron Zoria must hire a local erhu player when the Circle of Horns plays Republic City. It's in all those hybrid hot jazz numbers they have to play there. The Tsungi horn is at least easier to emulate with their own instruments, though they usually need to get a local person to do it and provide one, since a euphonium isn't as easily transported and they don't have a regular player for one. Ember Island Players - While the Ember Island Players are technically good (otherwise, they wouldn't have lasted this long, nor have a featured theatre on Ember Island), they tend to misinterpret the intent and genre of the shows they perform. Some people appreciate the dissonance that results from this... others don't. Sato, Minami and Ryo - Minami (22) and Ryo (19) are great-grandchildren of the great Professor Asami Sato. If Hiroshi was the Henry Ford of Diqiu, and Asami its Jackie Cochran et al., Minami is sort of its Tony Stark - the young tearaway heir to the industrial titan, technically brilliant but, in the eyes of the Board of Directors, a bit worryingly daft. Some look to Ryo to provide a stabilizing influence, but one expects they'll be disappointed. Not only is he not a particularly sedate soul himself, Minami has spent his entire life cheerfully, lovingly tyrannizing him. I quite liked this little bit of world building, btw. I understood it pretty instantly, and it was a tiny thing that made Diqiu (wow it's hard to type a q without following it with a u)feel more, I dunno, real and different from the rest of the UFiverse. >thing were her style, which it isn't. >actually an implement for driving threaded fasteners. It... isn't. *snrk* There's a microstory in the waiting there with Amy and Rory being clueless outsiders and Nall being a prick. >and regularly shows up at grade schools to talk about train safety. >scruffy ring-tailed ones. I make no apology for this. Momo was in the top three best characters in the original series. And had no lines. I'm somewhat disappointed by Naga in comparison. This might be my dislike of dogs and dog-like things showing through, however. Awww, I kind of like the idea that it's only something you can get by purchasing your tickets in person, knowing the correct code. I assume there's a corresponding discreetness on the way out? >used instead for the same function. That must be impressive to watch from the street (or a high rise apartment with proper sight lines). They could do regular (even if just annually) performances a la the traveling shaolin, where they just light up the sky. The Graflex being of course famous for giving us the lightsaber. Is that the one with a fixed focal point, and a chain used to determine proper distance? this stopped me in my reading tracks and I was unable to read on until I parsed that out. Which took a couple minutes and then I felt dumb, mostly because I was trying to fill in letters, not expand an acronym. >(motto: "Mr. Boomerang always comes back!"). True, although in fairness, Dorothy would probably be doing so even if she didn't know him. Well, actually, she'd have been scrapped by now if she didn't know him, but - well, you know. >>and regularly shows up at grade schools to talk about train safety. >Total aside: What's he gonna do with that? Give it to Kora? That's not true! He had five lines! ... OK, Aang was hallucinating at the time. But still! >I'm somewhat disappointed by Naga in comparison. Aw, Naga's great. Not as wacky as Momo, true, but it's worth the price of admission just for that scene in the noodle bar in episode 5. Besides, she's not really supposed to be the Momo equivalent in LoK; that's Pabu. >I assume there's a corresponding discreetness on the way out? Depends on where you buy your ticket. The ticket agents in Republic City are a little less obsessed with protocol than the ones in Ba Sing Se. >just light up the sky. I suspect there are, in fact, bending demonstration teams who go around like (or with) circuses, putting on shows. There are probably even comedy bending demonstration teams, like the Flying Karamazov Brothers with elemental superpowers. And, of course, there's the annual Fire Days Festival in most Fire Nation and western-UR towns. >The Graflex being of course famous for giving us the lightsaber. Indeed, it must be horribly annoying to be an actual Speed Graphic collector these days, doggedly scouring the Earth for the one goddam Graphic flashgun someone hasn't turned into a lightsaber prop yet. The classic Minox cameras did have that, yes. One imagines its (fictional, semiextradimensional) counterpart here is a little more sophisticated than that. Ceterum censeo Carthaginem esse delendam. >>Total aside: What's he gonna do with that? Give it to Kora? ><image removed>, except they say SUBTERRANEAN. No, the apartment in New Avalon. Sorry, switched gears on you in the middle there. One assumes that he's not going to maintain residence there, what with his little family, and it's not like he needs another part time residence (like his apartment in Valhalla)...or maybe he does? Are they still planning on staying on Tomadachi? Aha! I knew I had that slightly wrong, and couldn't be arsed to take five seconds to google. >>>Total aside: What's he gonna do with that? Give it to Kora? No, I expect he'll keep it. (There's even an oblique reference to the World Wide Building early in the movement, when Utena remarks that they'll need a bigger yard, and Corwin notes that in New Avalon they haven't got a yard at all, but plenty of roof.) Some remodeling may be in order, but that's why he never rented out the fourth floor. >Are they still planning on staying on Tomadachi? That's actually not something they're sure about themselves, at the moment. They'll be looking at it a bit in the next movement. If you're ever up here in Rochester, I encourage you to hit the George Eastman House. They have a pretty badass Museum of Photography there, including a number of super-spiffy Speed Graphics. >hasn't turned into a lightsaber prop yet. You think that's bad? Try being someone who collects mausers. Specifically, the Mauser C96. Classic firearm (I believe that Corwin's mauser is one of these, or at least a repro) and they keep getting snatched up by people who than chop them into pieces in order to make their own DL-44 replica. >You think that's bad? Try being someone who collects mausers. > Karamazov Brothers with elemental superpowers. >> Karamazov Brothers with elemental superpowers. Which my brain just parsed as "The Harlem Ghostbusters", placing the pre-game activities of that wonderful group of showmen into a whole different arena. My race is pacifist and does not believe in war. We kill only out of personal spite. Well... they have been on Scooby Doo a few times, so it's not like there isn't precedent. If it were done right, I'd watch the hell out of that. >>thing were her style, which it isn't. Some inscrutably DUMB CoM idiot (but I repeat myself) could make a tragically embarrassing mistake there. Waking up in a guarded hospital bed and mumbling "...but R. stands for robot..." to an unsympathetic copper. "You don't get out much, do you son..."
>cartoon. That's not even airing on Saturday mornings any more. I still feel inconceivable joy whenever this show's referenced. One wonders if they have plans to do a crossover with Jaeger Time. >than annotated reality, which is more what Utena had in mind. In the original canon this was first lampshaded in The Masque of Mandragora (Fourth Doctor, SJS) and was then not mentioned on TV until New Who. "Life is like an anole. Sometimes it's green. Sometimes it's brown. But it's always a small Caribbean lizard." What's the big deal about squirting a line of chocolate syrup on the ground and stepping over it? I believe Bosco chocolate syrup is being referenced. >I believe Bosco chocolate syrup is being referenced. Precisely! Maybe it's a bit too regional for Gryphon to have ever encountered it? >>I believe Bosco chocolate syrup is being referenced. As opposed to my original joke, where I was referencing an old Johnny Carson routine about navigating the Greater LA highway snarl, where he says, "Stop at the Slauson Cutoff, get out of your car, and cut off your slauson." The real Slauson Cutoff is apparently California State Route 90, formerly known as the Richard M. Nixon Freeway and renamed in 1974 for the obvious reasons. And that joke just writes itself, really. ...I am earwormed now, and it's ALL YOUR FAULT. Yeah, never heard of that before. This is Hershey's country up here. You know, I've lived in RI over 40 years, and never even TASTED that stuff? >Yeah, never heard of that before. This is Hershey's country up here. Well, we're Hershey country here, too, in the depths of wildest New Jersey. But when I was a kid, Bosco and Hershey were fighting it out for the chocolate syrup market.